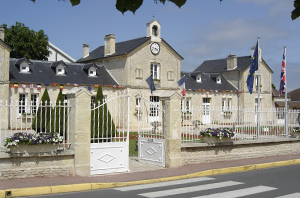 Ranville, with its 1778 inhabitants, is located in the canton of Cabourg in the Department of Calvados (Low-Normandy) and is to only 12 km of Caen, the regional capital. Ranville became famous for the grip of the bridge in the night from the 5 to June 6 by the 6th British airborne division, becoming thus the first village released in 1944. Ranville, offers a place of stay and meeting ideal to all those which like to combine the pleasures of the sea very close to the charm to the countryside Norman. We open this new Internet site of the commune. For you, who are from Ranville, this site was developed to inform you on the life of our commune, its organization, the activities proposed by many associations and the many organized demonstrations. For you who are of a nearby village or a distant area, we hope that this site will enable you to discover with interest our village. We will be with the listening of all your suggestions. Good surfing and return quickly, Ranville awaits you!